Squash House Quilts: Sasha, Sugar and Primroses! Spring is slowly showing her face these days. After a cloudy start today, we're now under blue skies and warming temps! This past winter we had our four, sixty year old Dogwoods pruned. I thought for sure all the trampling and branches falling along with winter would do in the Primroses beneath the trees. No Way! Isn't it wonderful to see so much color so early in the season? They pretty much never stopped blooming LAST spring! I think most of them kept on blooming throughout winter, along with quite a few of the winter pansies we planted in the fall! Here we are looking out from the front porch. 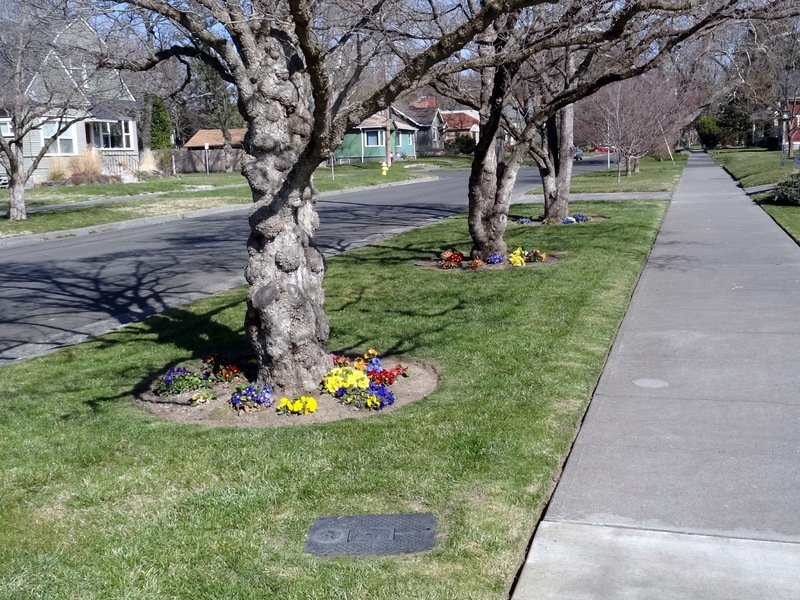 In driving around town, I think we have one of the most colorful yards so far! Miguel, who mows the lawn along with his wife Erica was here today for the first spring mowing. He also pruned the apples, pear and grapes along with some other small shrubs. Look here - there is even a cat growing in the front yard (wink)! Sugar heard my voice and came around from her sunny perch on the other side to say hello! Last summer it was all I could do to just get close enough for a light pat on the head. Now she rolls over, stretches and wiggles her back legs while I give her a good tummy scratching! Kitty love, I say! Speaking of kitty love, this little one has melted our hearts already! She's feeling right at home and talking up a storm! We call her motor mouth or little miss walkie talkie! 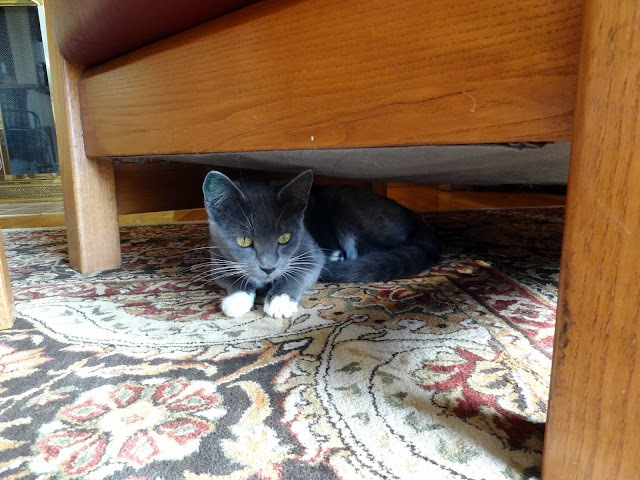 She is hiding under a chair while Mr. Squash washes the outside windows. There are many sounds she isn't used to yet...dishwasher, TV, dust buster, but she's being a real trooper! On the quilting front I'm nearly finished binding the flag quilt and almost done with the March Sweet Stitches project. I'll show them to you soon! The signs of Mother Nature doning on her spring wardrobe are a welcoming site. Our trees are budding and to my surprise, petunias and begonias wintered over. Wonderful yard, wonderful neighborhood and I can't wait to see your wonderful flag quilt! I'm so happy that Sasha is fitting in just fine. She is a real cutie! Your trees and flowers are gorgeous and so colorful. I love spring and all the colors after a long winter. Love the kitties, and so glad Sasha is adjusting so well. Looking forward to seeing your quilts!! Hugs. Beautifully manicured lawn, Candace. Purrrrfect for enjoying. 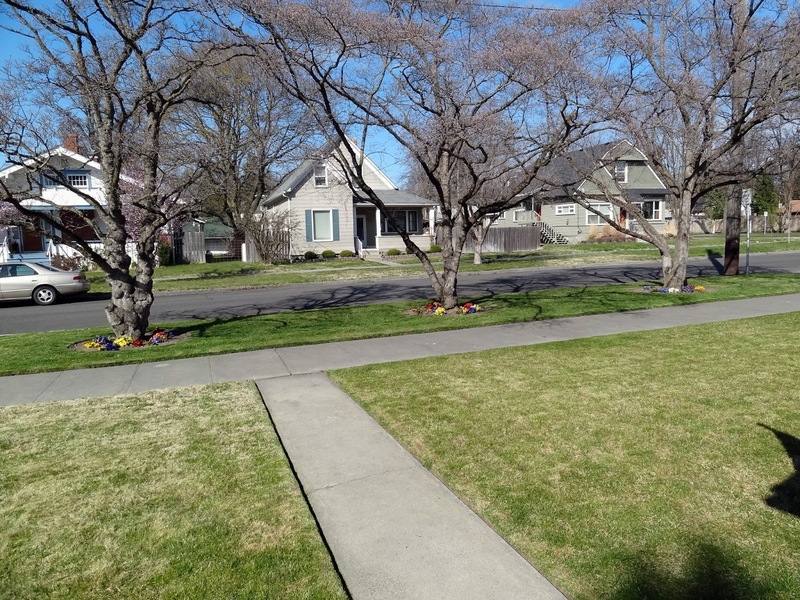 Your yard looks very nice and springy! 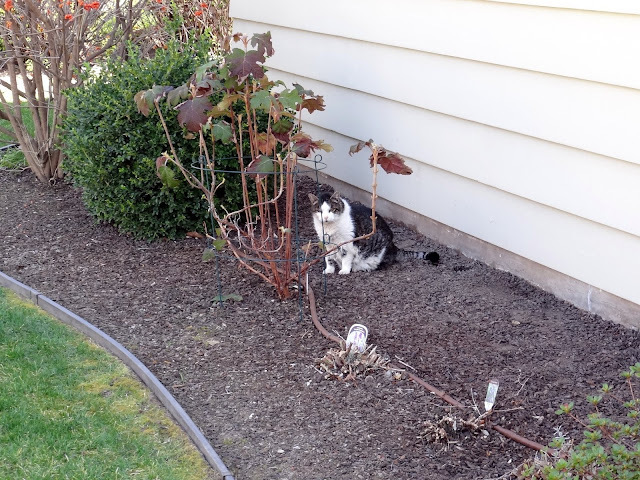 Is that an oak leaf hydrangea by your kitty? What a beautiful neighborhood. Sasha has the sweetest most dainty face. How is she with the sound of the sewing machine? Has Sasha met Sugar yet? Kitty love, you have lots of it now. Love the little white paws on Sasha. I can't wait to see your flag quilted, mine is a flimsy hanging at my LQS.I'm going to teach a technique based 6 session workshop with this pattern. Love your new kitty. We've had ours since he was 8 weeks old and he STILL hides when the doorbell rings, the vacuum cleaner comes out, etc. They're funny, aren't they? LOVE the flowers...I'm so ready for warmer weather. Those dogwoods are beautiful, especially the one on the left. Sweet little cat! I love how cute she looks perched under the chair. Also, primroses! I love them, they're my favorite spring flowers! 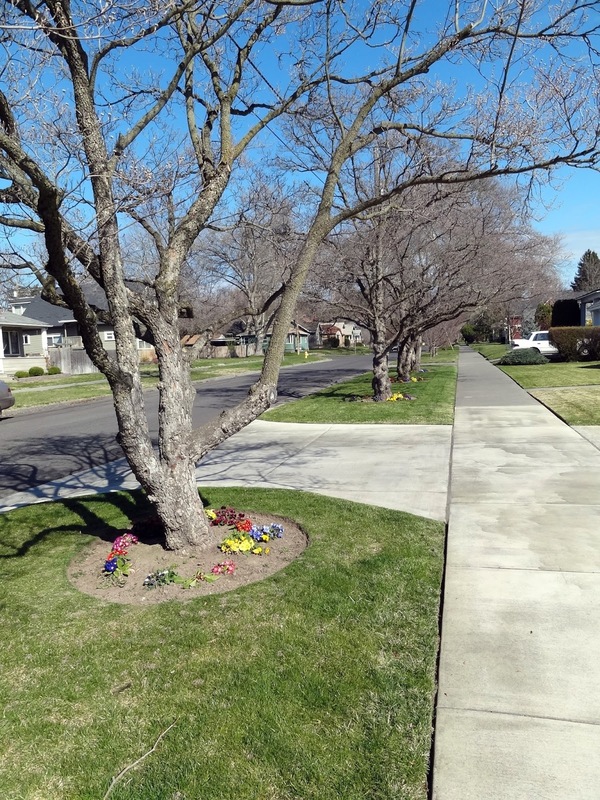 Wow,I can't believe all of the beautiful color in your yard - are you sure those aren't plastic flowers? Lol! Your kitties are both adorable. 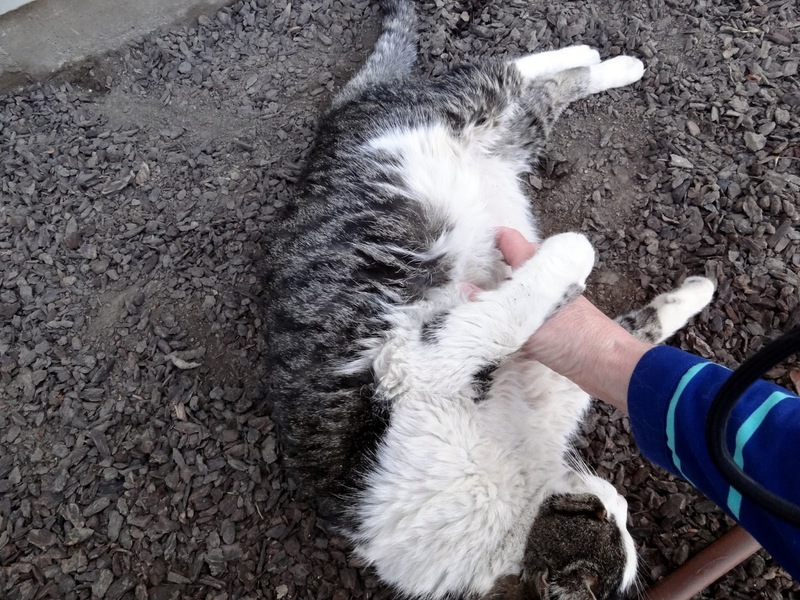 So glad that Sugar has learned that a good belly scratch is necessary! I bet Little Miss Sasha is a busy girl! Glad she is settling in. Those primroses for me are the sign that Spring has really arrived. Love the bright colours after all the grey. Sadly Spring hasnät quite arrived here yet but we are luckier than those inland who have had deep snow. Aww Sasha is sweet looking. I hope she gets on with Sugar.